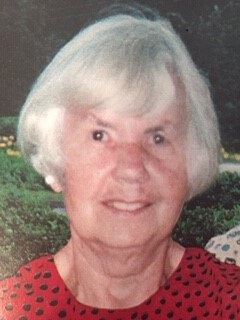 Mary E. “Grammie” Deptula, 88, of Columbia CT passed away on Monday March 18, 2019. She was born July 4, 1930, the daughter of Arthur and Bernice (Ives)Mott. Mary retired from Windham Hospital working as the secretary for the head of nursing. She was married to Walter "Dep" the love of her life for 62 years. They loved to travel and go dancing or just be on the farm together. Mary liked watching NASCAR Racing with her sons and UConn Women’s Basketball on TV. She enjoyed sewing and gardening. Mary is survived by her children Daniel, his wife Kathie of Storrs, CT, Douglas of Columbia, CT, Paul of Willimantic, CT and her grandson Dan, his wife Jen and their children Nick and Matt. She is also survived by her brothers, Paul and Edward Mott and her sister’s Joan Belanger and Lois Ereshena, her sister-in-law Sophia Edwards and several nieces and nephews. She was predeceased by her husband, Walter “Dep” Deptula, and her son Walter P. Deptula, brothers, Danny, Robby, Charlie, Roger and Herman and her sisters Betty Haggan and Orra Mott. Per her request there will be no calling hours. Online condolences can be offered on www.potterfuneralhome.com.